Welcome to October, DC Silver Age fans. Due to the upcoming movie and the fact that I had the opportunity to do a short history of Black Manta for the new BACK ISSUE #108 (on sale now!) I thought I should spotlight our favorite Sea King and reprise the first appearance of his greatest foe, Black Manta, from his debut appearance. 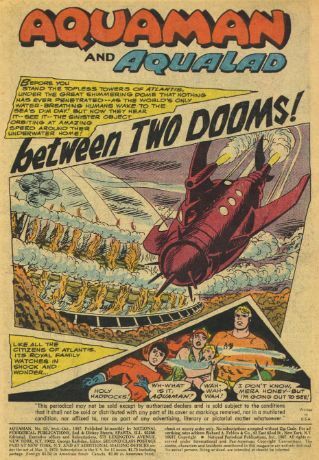 “Between Two Dooms!” was written by Bob Haney and illustrated by Nick Cardy and was the feature story in Aquaman #35 from September/October of 1967. George Kashdan was our editor and check out this nifty goodie from this year’s San Diego Comic Con. I’m not much of a toy guy, but I thought that was awfully cool. Okay, on to our tale, where we find Aquaman, Mera, Arthur, Jr. and Aqualad looking on from Atlantis as a strange, foreboding craft shows up. Aquaman deploys from the undersea kingdom and latches onto the vessel, only to discover the mutant Manta-Men spilling out of it. He makes a comment that, “It’s a trap…this vehicle is a lure of my old enemy…Black Manta!” As I noted in the Black Manta history, how he got to be an “old enemy” when he’d never been seen before is anyone’s guess, but since Bob Haney isn’t around to ask, I guess we’ll just have to accept it. Unfortunately, the Marine Marvel is now stuck to the side of the hull as Black Manta has made it a bio-magnetic trap. The Manta-Men then begin to sort of clap, sending deadly stun blasts toward our hero. Thus engaged, Black Manta, in his manta-like submarine, is closing in on Atlantis. As the other members of the Aqua-family look on, the ship deploys a sort of hose assembly, but Dr. Vulko assures Mera and Aqualad that nothing can penetrate the protective dome of Atlantis. Just then, on a monitor, they note Aquaman’s predicament and decide to help. Boarding the giant seahorses, Imp and Storm, they go to his aid and Mera uses her hard water powers to create a massive hammer to shatter the decoy vessel. Back at Atlantis, they are under siege from Black Manta as a cone of light from the hose assembly is causing particles to coat the inside of the impenetrable dome. Dr. Vulko deduces it’s a photon transducer ray, interacting with water, so they utilize the pumping system to empty it of water. A temporary solution at best, the 1-hour clock begins ticking until the citizens of Atlantis must breathe in more life-giving water. Part I ends with Aquaman and family heading back for Atlantis with the Manta-men in pursuit. Part II opens with them barely getting inside the dome. Ordinarily I’d call it an airlock, but maybe a sealock? Anyway, they get in and the guard on duty seals off the gate, activating a protective force field that sends the Manta-Men bouncing in all directions. Now to the task at hand, which is dealing with the threat of Black Manta before they all perish for lack of seawater. As Dr. Vulko attempts to rehydrate Atlantis, the violent reaction begins anew, so they have to abort it and now they try to figure out how to deal with it. Just then Aquaman instructs Dr. Vulko to use Serum X, a contingency plan they’d come up with to deal with such an emergency. The inoculations allow the Atlanteans to become air breathers. Aquaman and family do not receive them so that they can continue to roam the seas and protect their home. Black Manta, cruising around the dome in the Manta-ship, demands their surrender and Aquaman retorts that they’ve converted to air breathers and to push off. Manta does so and after the ship departs, Aquaman and Aqualad mount the giant seahorses to patrol, leaving Mera and Aquababy behind. Unfortunately, Manta was using a ruse and returns. Mera sends a hard water torpedo as a response, but the Manta-ship is equipped with an energy blast that dissipates it then follows up with a mist that knocks Mera out cold. By the time she regains consciousness, she is at her husband’s side in Atlantis, but Aquababy had been kidnapped by Black Manta. Soon the Manta-ship returns and Black Manta delivers the ultimatum that the child will be returned upon Aquaman’s surrender. The Sea King seems to have made his decision to acquiesce when another ship shows up, bearing his wicked half-brother, otherwise known as the Ocean Master, though at this point in continuity, he is unaware of that fact. Ocean Master spots Aquaman swimming toward the Manta-ship and a gloating Black Manta is already beginning to celebrate his victory when Part II closes. Part III opens with a pod containing Arthur Curry, Jr. being shot toward the domed city and another cone set to capture the Sea King. 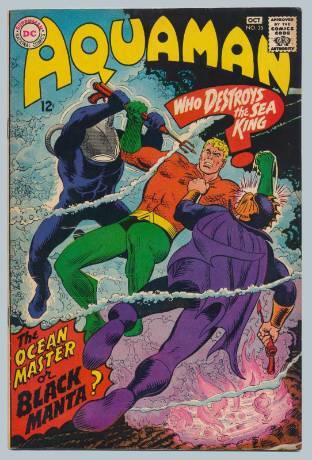 Ocean Master soon realizes what is happening and is enraged that the interloper, Black Manta, is interfering with what should be his triumph over Aquaman. Deploying a mechanical claw, Ocean Master intercepts the pod carrying Aquababy and the Manta-ship goes on the offensive. In an underwater version of a dogfight, the two ships engage while Aquaman, momentarily forgotten, is determined to free himself from the capsule so that he can save his son. Ocean Master gets the upper hand when he fires into some coral stalactites, damaging the Manta-ship and causing Black Manta to lose control. Ocean Master is gleeful, but fails to notice that Black Manta managed to fire off a torpedo that blasts his ship. Meanwhile, Aquaman has summoned a pair of whales to help him crack out of his portable prison. Ocean Master is unconscious and Black Manta sends his Manta-Men to finish him off, but Arthur, Jr. uses his own hard water abilities to knock them around like ten pins. Black Manta is about to take matters into his own hands with his modified spear gun when Aquaman approaches him. Ocean Master comes around and before Black Manta can do any further damage, he attacks. The two antagonists battle fiercely, but are then caught up in a swirling up current that takes them far away. 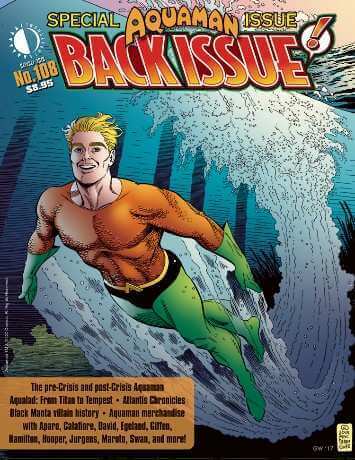 Aquaman, wounded, but determined to save his boy, staggers along the sea floor but soon collapses. Just then, the Ocean Master returns, having lost sight of his combatant, Black Manta. He spots Arthur Curry, Jr. and then the prone form of Arthur Curry, Sr. and reunites them in an interesting display of compassion before swimming away. Deep down, he seems to have an instinctive knowledge of their relationship, but cannot understand his own behavior. Mera and Aqualad arrive and find the revived Aquaman with Aquababy and they happily return to Atlantis, wrapping up this adventure. Both these villains would continue to give grief to Aquaman, with Black Manta moving up to top dog status after a while, even using Aquaman’s son as a bargaining chip again and ultimately taking Arthur Curry, Jr.’s life. The heart of Black Manta is truly as black as the deepest depths of the sea. I hope if you get the chance, dear reader, you’ll check out the new BACK ISSUE and particularly my history of the villain known as Black Manta. The Aquaman stories could be a little on the silly side and while I didn’t go into it, Bob Haney’s dialogue included plenty of undersea alliteration for the team to utter. Still and all, a decent story with an important introduction, so this one gets a solid 7 on the 10-point scale. Remember to come on back the 15th of October for a new review and as always, your input is invited. Just fire off an e-mail with your comments, questions or suggestions to: professor_the@hotmail.com and a reply is a sure bet.